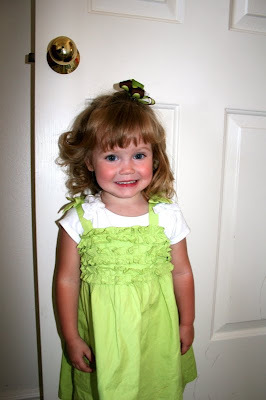 Tricia's Take: OOTD- Curls can hide a bad haircut! Curled up I don't think you can tell that much right? The tag sale is tomorrow... I am on a *shopping ban* and will use my 'cheat' item this week hopefully this top hits sale because I am all over it!!! 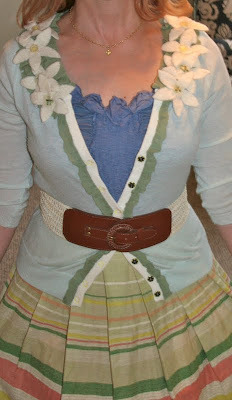 love that skirt you're wearing, the colors work so well with the felted lei cardi! lol. But so so sorry. My sister has had this multiple times now. Not sure how I lucked out with mine. You did a lovely job hiding it. Never would have known. And what a nice springy outfit. OMG! I lol'd when you said your son decided to do a home haircut on his sis. But it really doesn't look noticeable at all with the way you styled it. She is just adorable, btw! I love the mix of pieces in this very springy outfit. You look great! You could always just put her hair in a barrette on that side too. I always used to put a barrette with a bow on it in my daughters hairs. I would first put a coated rubber band in and then put the barrette in front of the rubber band (so the barrette wouldn't slide out). The bow would cover the rubber band part. Oh no - but the curls do hide the hack job, and your daughter's still super duper adorable! And look at you - you are all sorts of spring-time pretty in your outfit! I love it! I am laughing because it seems like every little girl either tries this on their own hair or has this happen to them at some point or another. My friend's little girl has SUPER short bangs because of this right now!!! With that cute little face no one is even going to notice her lopsided hair :) She's adorable!! That skirt is so cute...love the colorful stripes! Oh my goodness! 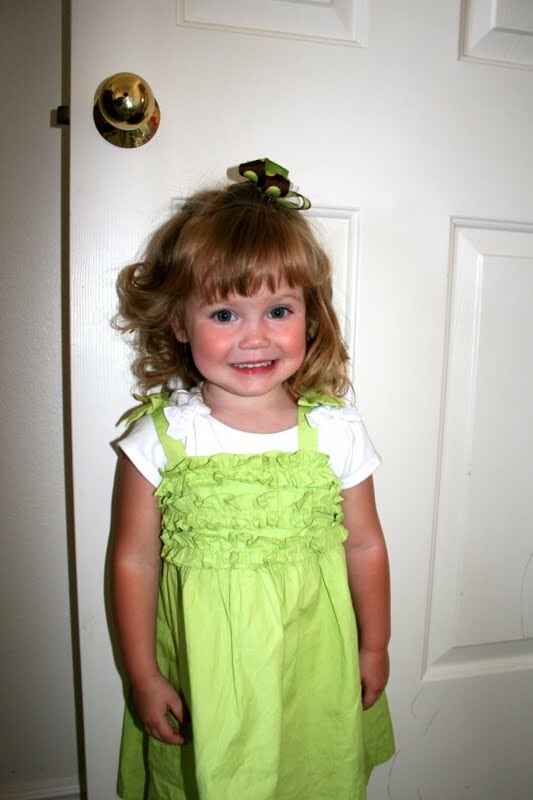 Your daughter is so darn cute it doesn't matter, the curls look great. That skirt is so cute! The shoes and belt tie in nicely. What a cute springy outfit. Oh no -- how sad about your daughter's impromptu haircut. But luckily it will grow back! And the curls do disguise it, quite well. Love this outfit on you! The cardi really pulls out the colors in the skirt nicely. I was in a no-Anthro phase when the Felted Lei cardigan came out, and I've given up hope of finding it -- whenever it pops up on ebay, it goes for at least $150!!! The Ardennes skirt and the Pot of Golds were seriously made for each other. You look darling!